Pulling the perfect shot of espresso every time is not a simple as it may look. Factors like the fineness of the grind, as well as the dose and tamp of the coffee grinds in your portafilter, are crucial to getting the ideal shot. It can be a challenge but with a little practice and these simple steps, you’ll be able to see and taste the difference. Grind fineness is a crucial aspect of your shot quality. Too coarse and it will produce a fast and under-extracted shot with a weak and sour taste. Too fine and you’ll get a slow and over-extracted shot with a bitter taste. The ideal texture for your coffee grinds will feel somewhat like granulated sugar - not chunky, but not quite powder. Perfecting the grind will require some trial and error. 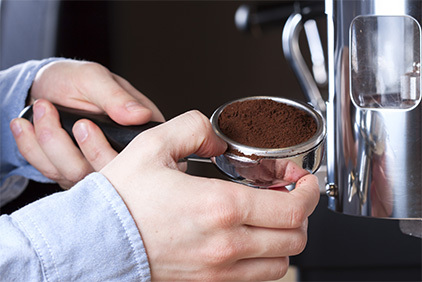 Experiment with your grinder and espresso machine to determine the right setting for your perfect shot. The dose refers to the amount of grinds dispensed in your portafilter. The ideal weight for a single portafilter is 7 - 8 grams. For a double portafilter, use 14 - 18 grams. Tamp refers to the amount of pressure applied to the grinds in the portafilter. Tamping the coffee ensures uniformity of extraction. By packing and levelling the grinds, there is consistent and equal water contact as it is forced through the portafilter. 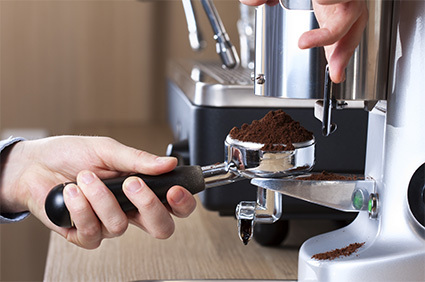 The most effective method for tamping is to first place your portafilter on a level surface. 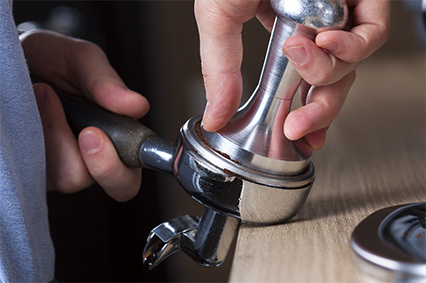 While holding your elbow at a 90 degree angle to ensure the tamper is level, apply 30 lbs of pressure until the grinds have a polished, even surface. When all three steps are completed, place the portafilter with the tamped grinds in the brew group of your espresso machine. Then place your preheated cup under it. The perfect brewing time you are looking for is 18 - 23 seconds for a 2 oz shot. When you’ve made the perfect shot, the first part of the brew will be dark. The brew will then turn to a rich, golden brown, which will finally be followed by a lighter foamy mixture, called the crema. The crema should flow into the cup in a thin, curly stream, and will be strong and thick enough to rest on the top of the shot without sinking. When you see this happen, you should pat yourself on the back. You’ve made the perfect shot.